If Anca Szilágyi’s Daughters of the Air is a fairy tale, it is a real one of the old school, forged in fire and annealed in blood. If it is a work of realism, it reveals how reality fractures in the face of falsehood — family secrets no less than state ones. The novel follows the fortunes of Tatiana “Pluta” Spektor, a young girl whose father went missing during Argentina’s Dirty War. Pluta, a runaway lost in New York City, reminded me of Clarice Lispector’s Macabéa, lost in Rio de Janeiro. And the way the author employs a fabulism bordering on the grotesque — as per Wolfgang Kayser’s view that “the grotesque is the expression of the estranged or alienated world” — reminded me of some of the stranger offerings of Nikolai Gogol. Needless to say, I loved this debut, and not just because I happen to know the author. A friend of a friend, Anca and I met a few years back at an Unchaste reading series event in Portland, and since then we’ve bonded over our politics, poetics, and shared love of Kate Bernheimer. While our novels are very different in style and setting, we’re both writers who grapple with how to engage with current events and past atrocities in fiction, and we both blend realism with fantasy. In anticipation of our "in conversation" event at Powell’s on February 19, 2018, Anca and I have been corresponding via email about writing political fiction in these fraught times. Susan: Though your debut novel is (worryingly) current in many ways, it also deals with the fallout of a specific historical event, Argentina’s Dirty War of the 1970s. What compelled you to focus in on this time and place? Anca: When I first learned about the Dirty War, around 2003, I thought it had troubling similarities to the US War on Terror, as civil liberties were being trampled and torture employed. But “terrorists” or “subversives” during this period of Argentina’s history included a wide swath of people: leftists, students, professors, academics, writers, lawyers… and a disproportionate number of Jews. There were parallels between the Dirty War and the Holocaust too: censorship, anti-Semitism, concentration camps, mass murder. What if the War on Terror took away more civil liberties, or took anti-Muslim sentiment to that extreme? I needed to know more about what had happened — were we heading in that direction again? So I was thinking about the psychology of turning a blind eye, even when something is right in front of you. I figured if I wrote a Holocaust novel, people might roll their eyes and say, “Oh, another one.” Well. We need to pay attention. But what about you? 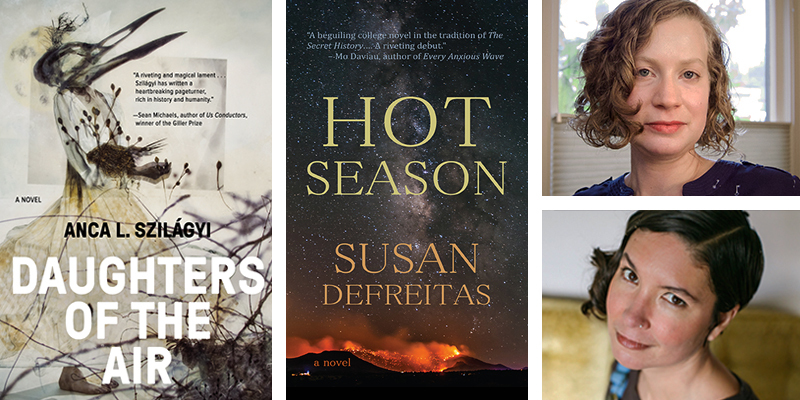 Hot Season wasn’t written just this past summer, when it seemed like much of the West Coast was on fire, and yet your novel centers on the verge of that explosion. What inspired you to pursue that story? Susan: I think when people consider you prescient as an author it’s because something was setting your hair on fire years ago that mainstream society is only now starting to get a hold of. Just the way you observed how the War on Terror began and saw ahead to the sort of world we live in now, I observed the rampant development of the Southwest in the early aughts, in blatant disregard for the limits of the land — particularly where water was concerned — and saw ahead to the whole of the West going up in smoke. One of my favorite authors, Lydia Millet, said this to me in an interview — that the real-world developments that shock many as coming from way out of left field (such as the election of Donald Trump) are in fact completely foreseeable to anyone who is really paying attention. But one of the most interesting things to me about Daughters of the Air is your approach — basically, exploring the emotional fallout of fascism via a realism that borders fabulism. What led you to approach this fraught subject from this angle? Anca: I think the short answer is that’s just how my brain works. But, to elaborate, realism is subjective. It is an accumulation of details a person chooses to notice and include. Some of my fiction stretches realism just a bit, to show something askew. And some of my fiction takes things further. I like to call it elastic realism, and I hope through the gradations or stretchiness of it, readers might find magic in their own lives. More to the point, when dealing with fraught territory, that elasticity offers more emotional possibilities (such as with Pluta, who finds difficulty articulating the trauma she is experiencing) as well as possibilities for escape. I’ll always remember what Kate Bernheimer said once, about how fairy tales are radical: sometimes you have to cut off a finger to use it as a key to get out of a locked room. Susan: Yes! That’s a prime example of an experience that feels magical: listening to an apple tree sizzle in the sun. Like looking out over a landscape and seeing the grand geological story beneath it — the fact that the desert was once an ocean — or even enduring a summer without air conditioning. I think those liminal experiences, which dwell in the shadow country between realism and fabulism, often arrive in our lives at points of significant change, which of course is where fiction lives. Denis Johnson, more than any other writer, I think, illustrates that principle, which you’ve termed “elastic realism” (love that!). I think it’s interesting that both of our debut novels are realist bordering on magical (though yours more than mine), while we’ve both written short stories that are more explicitly speculative. For me, quite honestly, that’s because it has taken me years to grant myself permission to work “in genre” — I think I wanted to establish my credentials as a literary writer before I starting writing about sorcerers and time slips and such. How about you? Anca: First, I love that idea of a grand geological story. I think, in part, it’s that sort of thing that draws me to myth. Shape-shifting of all kinds. But to answer your question, giving myself permission as an adult is definitely part of it. I think fondly of middle school creative writing assignments where anything was possible, or hiking with my parents and telling them about the “little people” that lived in the woods. I didn’t major in creative writing as an undergrad, so I wasn’t exposed to a lot of the expectations common in that environment. I was a big fan of Ralph Ellison’s Invisible Man and Günter Grass’s The Tin Drum, and at least some of my short stories were trying to skew that way, maybe a bit timidly. When I got to my MFA there were a lot of “rules” my classmates were coming in with that were a mystery to me. Toward the end of the program, though, I did an independent study on fairy tales with Maya Sonenberg. I asked her to expose me to authors like Angela Carter, which led me to a whole other world of weird: Robert Coover, Rikki Ducornet, Lily Hoang… in my last workshop, I brought in a fairy tale and no one knew what to do with it. The year after my MFA was wonderful, however, because I decided to write as indulgently as I wanted. I ended up writing a story called “More Like Home Than Home,” which landed in Fairy Tale Review. A few years later, under the influence of Anne Carson’s Red Doc>, Murakami’s 1Q84, a Tilda Swinton movie, and a fever, I wrote my weirdest story yet (“Cauliflower Tells You”) and got enough praise to realize I needed to keep following the weird. In your speculative fiction, is there a particular kind of fantastic you’re pursuing? Susan: It’s really all over the place. I too gave myself permission to write whatever the hell I wanted after grad school, and that collection of short fiction really straddles the line between realist and fabulist. All of the stories revolve around aesthetic fixations of mine — games, mirrors, dolls, codes, secret societies, dreams — and all of them are recursive on some level (stories about stories, artworks that contain artworks). That, to me, was the focus — whether magic crept in was up to the individual stories themselves. But I do feel an equal allegiance to realism, particularly to the work I produced in grad school, from which Hot Season arose. I’m not ready to stop talking about activists and artists and makers and dreamers — the people pushing back in the face of US fascism, on the destruction of the sacred. So while I’m still building Frankenstein in my backyard, the project on the front burner right now is the sequel to Hot Season, part of a trilogy I think of as my love song to the resistance. How about you? Which direction do you think you’ll move in next? Anca: Ooh, a sequel! I can’t wait. I also have a collection — inspired by family stories from Romania (the aftermath of the Holocaust, life under a Communist dictatorship, emigration) — where I’m playing with that elasticity, with some stories that are more realistic than Daughters of the Air and some that are more fantastical. They all explore notions of home in one way or another, including feeling at home in one’s body. My next novel is set during the economic crisis of 2008, from the point of view of a diorama artist who admires the work of Joseph Cornell. It’s less speculative, but there is still some level of surreality through the artist’s vision. I’ve been experimenting more with lyric essays, too, mostly about food; food seems to crop up in everything I write. Susan: Food and fairy tales! Perfect. Anca L. Szilágyi is a writer. Her fiction appears in Lilith Magazine, Gastronomica, Fairy Tale Review, Washington City Paper, and other publications. Her nonfiction appears in Salon, Los Angeles Review of Books, Electric Literature, Jewish in Seattle, and on the Ploughshares blog. She was awarded an inaugural Made at Hugo House Fellowship to complete her short story collection, More Like Home Than Home, and for Paralegal, her novel-in-progress, she was awarded a grant from 4Culture and a 2015 Jack Straw fellowship. In 2015, she was awarded the inaugural Artist Trust/Gar LaSalle Storyteller Award. The Stranger hailed Szilágyi as one of the “fresh new faces in Seattle fiction.” Daughters of the Air is her most recent book.